That is half the battle. Check that – it’s 99% of the battle. If you have a great host, the rest gets so much easier. Just think: Would you rather listen to a dull host with great audio quality or an engaging host using so-so tech? A podcast is really three things: a show-level concept, an episode-level format, and on-air talent. Of the three, the host is by far the most crucial thing to get right. Whether the person is an inquisitive interviewer or an inspiring storyteller, the very first thing to decide as a marketer before launching your brand’s podcast: Are you (or your planned host) any good on a microphone? If not, who is? A great podcast requires performance talent. Everything else is incremental. Of course, there are ways to get better as a performer on that microphone. Here are a few of my favorite techniques. Audio is a strange medium for many because it shouldn’t be hard, but it’s incredibly hard. You never have “talker’s block.” Voice is the most natural way we communicate as humans. But that doesn’t guarantee you’ll be great simply by speaking into a microphone. However, if you keep the golden rule of audio in the back of your mind, you can make the best decisions possible for your listeners. Audio is what I call a linear medium. Listeners can move only two ways through the piece – forward and back. They can hit play and stop. If you’re lucky enough to get someone to hit play, as the host you have one job: Make sure they don’t hit stop. In other words, the golden rule of audio is: Get listeners to the end. Audio is intimacy that scales. You can turn digital connections into real-world contacts – any host who has experienced the weird-but-wonderful moment when a listener talks to them like an old friend can attest. Your podcast should hold people’s attention for a significant time. It’s a beautiful thing for marketers who are used to acquiring attention 30 seconds at a time. Once you hold someone’s attention and build trust, all the other things a marketer hopes to achieve get easier. But you have to remember the golden rule. You must get them to the end. This mental reminder is more than a technique, but if you focus on it at all times, you’ll make the right choices. For example, if you follow the golden rule, should you front-load all your boring housekeeping? Shouldn’t you start the episode with a cold open, a teaser, or an agenda? Implied assumptions are harder to spot but arguably more dangerous. You can’t spot them by listening to the words a host says. Instead, they’re more subtle, as the problem lies with how a host behaves. Namely, hosts may assume that their role is to be the star. It’s not. A great show host is the guide. She stands shoulder to shoulder with the listener and points out interestingness and clarifies or distills complexity. She’s a vessel, someone who has uncovered something – an idea, a story, an interesting guest – and she’s here to share that with you. Yes, the host can be the lone voice, and yes, the host can be a celebrity or grow her celebrity through her podcast. But the host must relate to the audience for that audience to agree to go on a journey (the rest of the episode or series) with the host. Even the great Jerry Seinfeld admits he only gets a few extra minutes to simply “be” Seinfeld on stage. After that, he has to deliver something valuable to the audience. Right away, he aligns himself with us, the listeners, from where we stand. We’re most likely to think of memory – the subject of the episode – in a certain way. We have some preconceived notions about the topic. Robert acknowledges that, discussing it in brief detail using the show’s signature blend of story and sound design. Now that he’s shoulder to shoulder with us, he can walk with us each step of the way until the lightbulb goes off in our minds and we think, “Aha! Memory is really X.” But make no mistake: For us to successfully understand an episode’s topic, the host can’t just hand us the answer. We have to arrive there logically, in the right order, and in our own minds. That’s the difference between great hosts and most brand hosts: The latter usually hand us information before we understand why that’s the answer at all. In other words, a great host goes on a journey with the audience. And then a voice of an expert cuts in (“Yes!”) and away they go on this journey to debunk our preconceived notions and to truly understand memory. Back to Jad for a second: Why does he say “maybe” when he knows the answer? He has spent hours researching this subject. He’s done all the interviews. But he still acts like he doesn’t know the answer yet. Why? Because we don’t. We as listeners don’t yet know the answers that the host knows. And to get us to continue to listen, Jad teases new possibilities rather than handing us the answer. If he had given us the answer, not only would he lose the ability to bond with us and develop that wonderful intimacy over time, he would have confused or frustrated us because, again, we don’t know what he knows. So, within one episode, Jad and Robert take us on a journey. But they – and other great shows – also take us on a journey across the entire show, not merely within one episode. This is what’s missing from so many podcasts from brands too. The host should be a guide not only in an episode but into a subject the listeners deeply care about in their lives. A show is a great vehicle to explore something important, not simply talk to experts about a bunch of topics relating to one’s work. If you talk about social media marketing, for instance, why not “journey to the far reaches of the social web to uncover the world’s most creative social media experiments”? If you cover sales, maybe take an angle – “going inside the processes and workflows of the best salespeople on earth to learn how they spend their time.” Sure, you’ll cover some of the same subtopics your competitors do, but having a firm angle on the show means you can position each episode as an unfolding journey, enticing subscription, and boosting anticipation. You won’t have to rely on each and every guest to be bigger and better-known than the last. Go on a journey with your audience. Signposting is an audio technique that hosts use to ensure that listeners don’t miss crucial details. It’s the act of pointing something out in plain language before or after the thing is introduced. If listeners miss a key detail, they’re left wondering what happened. They get confused or lost and by the time they resume listening, they’ve now missed even more of the episode. Missing important moments can derail the listening experience and signposting solves this problem. Here, Jad introduces a couple signposts. The first and most subtle one is the pause and the word “until.” He emphasizes the word, as if he’s saying, “Everything was as you’d expect UNTIL …” Dun dun duuuun! Something is about to happen. If you were zoning out, better snap back to attention. Did you spot the signpost? How did this host set up the listener to catch a crucial forthcoming detail? Read it again. Any idea? Well that begs the question: Why? How does this person open those episodes? You point out a detail of something you (the host) knows and the listener doesn’t … yet. Listeners must take the next step in the journey to hear about it. And as we take this journey with a host, that host has to remember to do his or her job as an interviewer. I’ve heard hosts complain before that a guest was “too corporate” or “not charming” during an interview. But if your guest isn’t giving you what you need to create a compelling episode, that’s not the guest’s fault. That’s yours. Above all, ask the right questions to extract the right content. I like to have a three-pack of arrows in my quiver if I need to shoot them. The entrepreneur has few ways to answer other than giving me exactly what I want: the juicy details. Regardless of how your personal style manifests as a host, don’t obsess over the incremental stuff: the tech, the marketing, the ROI, the design. All of that is important, but all of that comes later. The foundational aspect of a great show is a great host. Being great on a microphone is what a podcast really is. Marketers can’t simply be hosts. They have to understand and work hard to become great hosts. Understand how to perform on a microphone, whether that’s narrating, interviewing, telling stories, or sharing your own wisdom. Engage listeners from the moment they hit play and ensure that they don’t hit stop. That’s all this is. Don’t forget it. 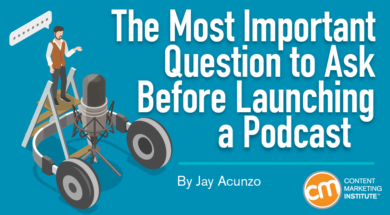 The one question marketers need to ask before starting their podcast: Are you any good on a microphone? Hear more of Jay Acunzo’s great wisdom when he talks how to be better than best practices at Content Marketing World Sept. 4-7. Sign up today and use code BLOG100 to save $100. ← Why Do Editors Reject Guest-Content Pitches From Brands?